So it begins…the Swamp Thing-a-Thon. Okay, gang, I finally started it. My ideally-twice-monthly looks at every Swamp Thing comic, in order, available initially to Patreon contributors (for as little as a buck a month!) before eventually getting posted on this site several months later. Well, with the exception of the first post in the series, which I’m including here as a sampler for those of you previously unfamiliar with my excessive typing. A couple of notes: I’m just going with the credits as listed in the book (or “borrowed” from the Grand Comics Database). I know Wrightson had some assistance on this first story, but, I don’t know, it seemed weird wherever I plugged those other names in there. Maybe I’ll add them in later…lemme sleep on it. Yes, that’s a scan of my actual copy of House of Secrets #92. The plan is to scan the covers of my personal copies for each installment, so you can see how beat up my copies get while reading them in the bath, while eating barbecue ribs, etc. I am not 100% certain what content I’ll be including for each “review.” You’ve read my reviews before, you should probably know what to expect. Maybe it’ll be story analysis, maybe it’ll be some personal recollection regarding that specific issue, maybe it’ll be something retail-related…we’ll see what each issue inspires me to write as I get to it. Anyway, here it is…if you want more of it, and faster than waiting for it to show up here, then hie yourself hither to my Patreon account and drop at least a buck per month (or $100 per month, I won’t stop you) to get access. Thanks for reading, pals, and I’ll be back with More Stuff™ soon. TITLE AND CREDITS: “Swamp Thing” – written by Len Wein, illustrated by Berni Wrightson, coloring by Tatjana Wood, lettering by Ben Oda. Cover art by Berni Wrightson. IN BRIEF: Alex Olsen is believed dead, killed in a lab explosion secretly prepared by rival Damian Ridge, who then takes Alex’s widow Linda as his own wife. However, Alex rises from the bog in which he was buried, transformed into a hideous creature, a swamp thing, who must come to his wife’s rescue when Damian begins to have designs on her life as well. MIKE SEZ: Well, here’s where it all begins. What struck me as I read this again for the first time in quite a while is the parallels between how this story starts and how the relaunched/rebooted Swamp Thing ongoing series starts about a year later. I mean, not just the premise, obviously, but just structurally. Both this tale and the later Swamp Thing #1 start with our muck-encrusted mockeries of men looming outside their homes (well, barn, in the latter case) worrying about the people they left behind as they continue their lives within, leading towards the record scratch/“yeah, that’s me, you’re probably wondering how I ended up here” flashbacks that follow. What also impressed me was just how much storytelling and emphasis on character perspectives were crammed into these eight pages. You start off with the first-person narration from Swamp Thing himself, leading into Linda’s second-person narration (like “you smile because he expects you to” — rarely seen outside EC Comics, text adventure computer games and “Choose Your Own Adventure” books) and her recollection of the disaster that killed her husband, then back to first-person narration for Damian’s involvement in said disaster. If I can talk like an old person for a moment, nowadays were so used to stories stretched out over multiple months, decompressed into 5 or 6 or 8 issues that conveniently fit into a nice paperback collection, that it feels just a little weird to have this much narration, this much dialogue, squeezed into so little space. And yet, it never feels cramped. Yes, it’s all very text-heavy, but not at the expense of Wrightson’s art, which shares the burden of the story’s emotional weight. The narration explicitly tells us what everyone’s feeling at any given point, but the illustration conveys so much. Linda’s downcast looks of quiet sadness, Damian’s crazed desperation as he decides to kill Linda to protect himself, Swamp Thing’s glance down at his wrist where the bracelet Linda gave him once was…and the long, thin panel immediately afterward of Swamp Thing’s eyes rolled upward in despair. It’s the ideal balance between writer and artist, creating a tiny little masterpiece in the short feature format that’s mostly forgotten by the Big Two companies. Speaking of the art, there’s something to be said about the portrayal of Swamp Thing himself. The human characters are all very naturalistic, which is only how it should be given that heavy photo reference was used by Wrightson in laying out the art. But Swamp Thing himself seems almost…cartoony, by comparison. He’s a big misshapen lump, mostly hidden in shadow so that you can’t ever get a real feel for what he actually looks like, with the exception of those previously-mentioned eyes. They’re large, lolling orbs, perpetually sad, poking out of the top of a figure that we can only barely discern. He doesn’t look scary, even when he’s bursting through that window at the climax to stop Damian. He looks…pathetic. He looks every bit as despairing as he feels. Now the character goes through a serious redesign into a more muscular-looking “action hero” type (I mean, relatively speaking) once that ongoing Swamp Thing series starts, but here, Swamp Thing’s sodden, burdened mass reflects the weight and tone of this short piece. I’ve stated in the past that Spider-Man’s debut in Amazing Fantasy #15 is the Perfect Superhero Origin Story. Everything you need is right there, and in fact the story needn’t have continued. If the only Spider-Man story Stan Lee and Steve Ditko ever produced was just those 11 pages…that arguably would have been all the Spider-Man the world ever needed. Nearly everything that came after that was just extrapolation from the original. I bring that up because this story, “Swamp Thing,” is I think in the same upper echelons of comic book origins. Perfectly constructed. No threads left untugged. No need to continue. And, in fact, there was no intention to continue “Swamp Thing” (unlike Spider-Man, which was designed to be a new ongoing superhero character, even if they weren’t sure at the time he actually would continue). 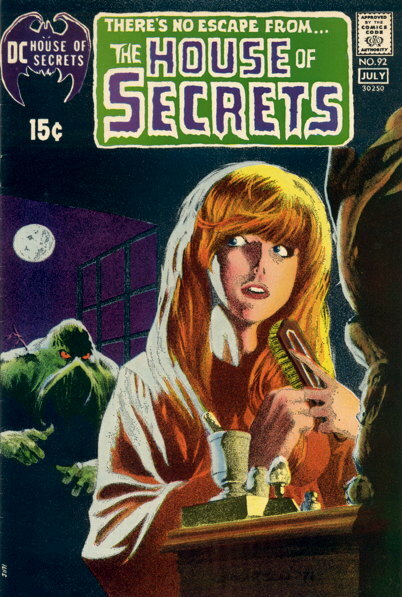 However, once the sales figures came in on House of Secrets #92, and after some convincing, Swamp Thing would return…but it wouldn’t be turn-of-the-century Alex Olsen, but the modern scientist of 1970s-today Alec Holland who would take up the mantle, as Wein and Wrightson didn’t want to dilute the power of their original short. Of course, a few decades later another writer would figure out a way to make Alex Olsen part of the latter Swamp Thing’s continuity, but that’s a Swamp Thing-a-Thon review for another day. THE WRAP-UP: One of the all-time classics in the comic book medium, and almost certainly the best short horror comic story you’ll find outside of the legendary EC Comics oeuvre. Truly, this is the Muck-Encrusted Age of Miracles! Having read your review, I really want to track down a copy of House of Secrets #92. The pathetic horror of the original story was perfectly matched by the image of skimpy underwear made of soggy vines that immediately jumped into my head when I read the article’s title. Honestly, I’m not sure I will ever be able to get the Swamp Thing-a-Thong out of my head. Wasn’t she married to Woody Allen? TCM aired Swamp Thing last night, and I am still confused as to what the plot of the film was, as the movie basically opens with Adrienne Barbeau flying into an unnamed place filled with swamps (a gorgeous woman, the scene with her washing off in the river is presented in all its glory), and I guess a red shirt type character getting killed by snake bites…but it looked great in HD, and the swamp boat battle was surprisingly well done and one of the highlights of the film.